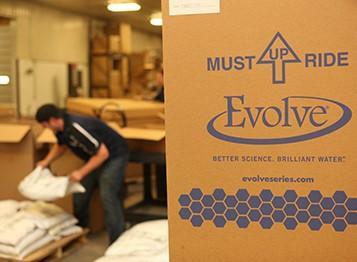 Evolve® is a trusted name dedicated to advancing the science and art of innovative water treatment solutions. To us, innovative water treatment means providing more efficient water so you can have a more efficient home, with longer lifespans for your appliances, plumbing, and fixtures, while also assuring better health for your family. Backed by over 50 years of manufacturing expertise, Evolve®'s water treatment systems will fulfill your family's needs with the highest level of efficiency and versatility. After all, better science makes brilliant water. Our corporate headquarters, located in Appleton, Wisconsin, is also home to our dedicated manufacturing operation. From our 80,000 sq. ft. facility, we support a nationwide network of water treatment professionals, including a growing international dealer base. The Evolve brand is owned by Water-Right, Inc.